The tsunami relief effort continued today, and while I wouldn’t say things are returning to normal, I will say they’re a helluva lot less intense than they were yesterday. Neither me nor anyone I know was assigned to look for bodies today. 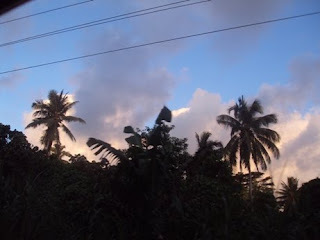 In fact, I spent most of the day in the car riding back and forth between Lalomanu and Apia. Aside from providing moral support and “being present” the only actual work I did consisted of carrying a stack of three pots and then three bags of clothes across a room. While the Red Cross still needs volunteers, it also has more volunteers than it knows what to do with. Talking to people at the end of the day, it seemed like everyone experienced a lot of down time today. That said, everyone I talked to agreed it’s better to have too many people around than to not have enough. My fear is people will get bored and not show up tomorrow, and then the Red Cross will really need volunteers. In any case, my driving buddy Ruane picked me up this morning, and we headed to the Samoa Red Cross headquarters in Apia where we filled the back of Ruane’s truck with boxes of bottled water. Once we’d filled the flatbed, a bunch of Germans jumped on top, and two climbed into the cab’s backseat, and we set off for Lalomanu. In college when I went with a group to work with the park rangers in Death Valley, the rule was for each leg of the journey, everyone had to switch cars to get to know each other. While the Red Cross has no such rule, Ruane and I ended up travelling with a slew of passengers who provided a good cross-section of relief volunteers. The day started with a pair of German tourists, Steve and Daniel, who stayed at the Tanu Beach Fales in Lalomanu on Sunday night and were scheduled to stay Monday night as well, but decided to leave early. They knew other Germans who ended up staying Monday and got caught in the tsunami. All of their friends survived, but one’s legs were so badly beat up by the force of the water he required complex skin-grafting surgery. Steve and Daniel were in good spirits this morning, and didn’t seem too miffed about spending their holiday providing relief aid. 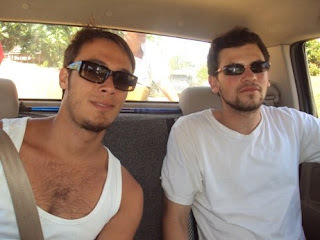 They stayed around in Lalomanu while we were sent back to Apia to pick up more supplies. 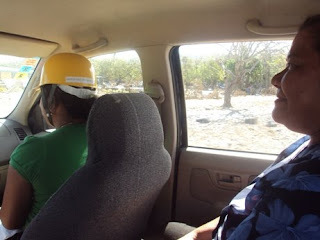 As we were pulling out of the Lalomanu camp, a middle-aged Samoan man, Atonio, jumped in the back of the cab. He recognized me as a Peace Corps because he works security at the hotel that shares a building with the Peace Corps office. Atonio works six days a week , but Thursday is his one day off, so he headed down to south coast to help. He was a sport with my broken Samoan and complimented Ruane on her driving. Back in Apia we picked up 12 boxes of hygiene kits and 12 boxes of baby kits. I joked that I thought most babies came pre-assembled. Ruane didn’t get it. Three Samoan twentysomethings piled in the back: Leo, Ana, and Feyra. Leo took the ASVAB, and planned on joining the US Army before his parents put a stop to it. Ana works for the Samoa AIDS Foundation. Her office had a half day so they could volunteer in the afternoon. Feyra works for Samoa Red Cross, although I was unclear on her actual title. The three of them were quite giggly. Upon arriving in Lalomanu, we were instructed to deliver supplies to the pulenu’u (i.e. Mayor) of Lotopue. Two Red Cross Volunteers rode in the flatbed, and two rode up front, Leata and Kiona. They worked for a church organization, I forget which. Kiona told jokes. Leata introduce herself as Leata faise Tom Cruise. It may have just been the difference that a fresh set of eyes makes, but things seemed to have improved much since yesterday. Passing through small villages that elicited gasps yesterday brought on sighs of relief today. While there were no structural improvements, it seemed as though certain villages worked through the night to clear debris and wipe the slate clean. At the end of the day on the ride home, the Germans from this morning were back in the cab. We compared notes from the day and watched the sun set in the distance. Daniel talked about his 2007 trip to Zimbabwe where he worked in an orphanage for two weeks. I was dropped off first. Steve asked if he could take my picture, and they waved goodbye. I told them I’d probably see them tomorrow. Pictures below. I hope you’re well. 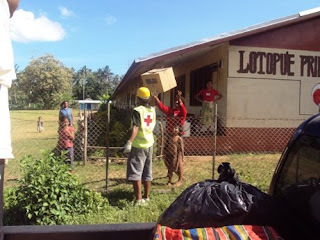 Distributing a baby kit to a family at Lotopu'e. Fili, Akiyo (a JICA), Sa, and Ofisa. Malo Matt. Thanks for the update. What a great job you and you're fellow PCV doing. I didn't know there's a village called Lotopu'e. manuia tele le weekend. Be safe. Faafetai tele. Leah. I think Ikea invented baby kits - cheaper to ship than pre-assembled.